One party must act first and then the second party can decide to execute both trades or not. This decision can be influenced by price changes in any of the two assets in the intervening period. This provides the second party to act with optionality. Either way, the second party has optionality. Both Alice and Bob sign it. 3 Alice Alice creates and signs a transaction sending the 1 BTC output of transaction 1, back to herself. The transaction is time locked for 24 hours. 4 Alice Alice sends transaction 2 to Bob. 5 Bob Bob signs transaction 2 and returns it to Alice. 6 Alice Transaction 1 is broadcast to the Bitcoin network. 7 Bob Bob creates a Litecoin transaction sending 100 LTC to Alice. 8 Bob Bob creates and signs a transaction, sending the 100 LTC output of transaction 3 back to himself. 9 Bob Bob sends transaction 4 to Alice. 10 Alice Alice signs transaction 4 and returns it to Bob. 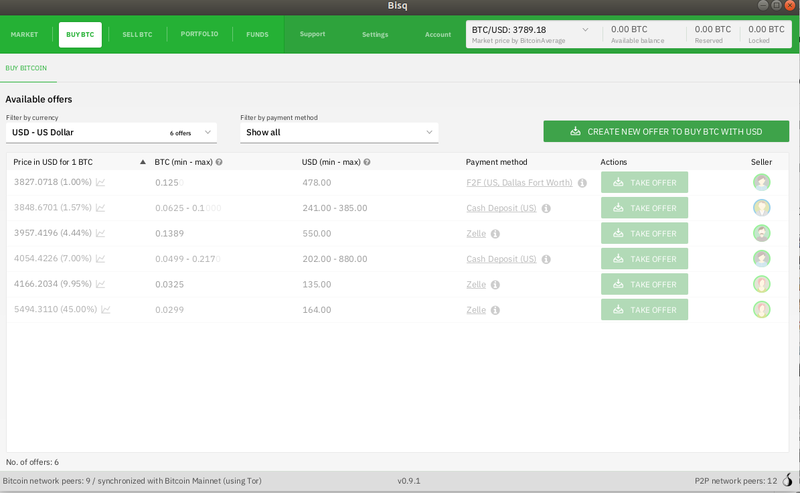 11 Bob Transaction 3 is broadcast to the Litecoin network. At this point, Alice has the optionality.If the LTC/BTC price ratio increases, she could continue the swap process. Or, if the LTC/BTC price ratio falls, Alice can end the process here. 12 Alice Alice spends the output of transaction 3 to herself, revealing X. Alice now has 100 LTC. 13 Bob Bob spends the output of transaction 1 to himself, using the X Alice provided above. Bob now has 1 BTC. 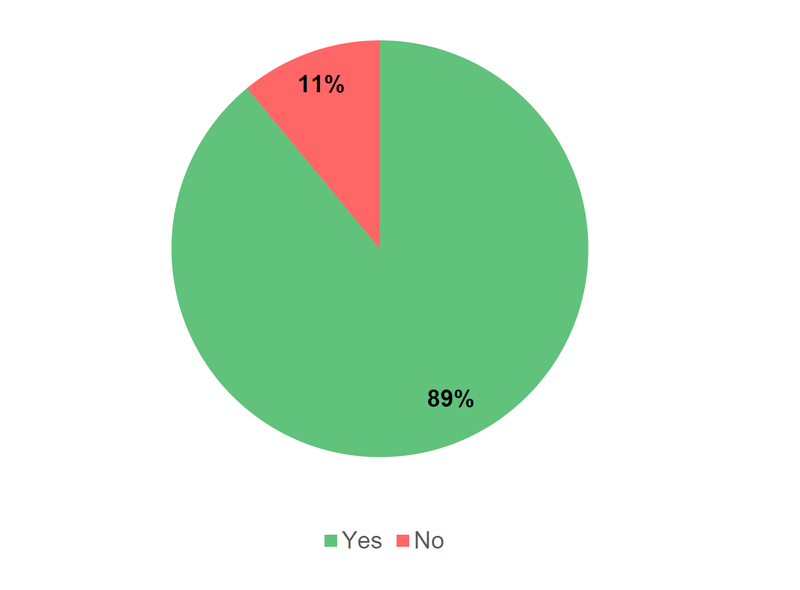 Would Bitcoin’s mass adoption fundamentally transform the financial system? We look at common misconceptions with respect to how banks make loans and the implications this has on the ability of banks to expand the level of credit in the economy. We analyse the inherent properties of money which ensure that this is the case. We then consider why Bitcoin might have some unique combinations of characteristics, compared to traditional forms of money, namely the ability to transact electronically and avoid a third party financial intermediary, thereby avoiding the need for bank deposits, which fuel the credit cycle. We explain the implications this could have on the ability of banks to engage in credit expansion. The core characteristic of the traditional banking system and modern economies, is the ability of the large deposit taking institutions (banks) to expand the level of credit (debt) in the economy, without necessarily needing to finance this expansion with reserves. An often poorly understood point in finance, is the belief that banks require reserves, liquidity or “cash”, in order to make new loans. After-all where do banks get the money from? It is true that smaller banks and some financial institutions do need to find sources of finance to make new loans. However, in general, this is not the case for the main deposit taking institutions within an economy. If a main deposit taking institution, makes a new loan to one of their customers, in a sense this automatically creates a new deposit, such that no financing is required. This is because the customer, or whoever sold the item the loan customer purchased with the loan, puts the money back on deposit at the bank. Therefore the bank never needed any money at all. Indeed there is nothing else people can do, the deposits are “trapped” inside the banking system, unless they are withdrawn in the form of physical notes and coins, which rarely happens nowadays. As one can see, the above process had no impact on the bank’s liquidity or reserves, the bank never had to spend any “cash” at any point in the above example. Of course, the seller of the property does not necessarily have to have an account with the same bank as the one which provided the loan. However large deposit taking institutions, such as JP Morgan, HSBC or Bank of America, have large market shares in the deposit taking business, in their local markets. Therefore, on average, these large banks expect more than their fair share of new loans to end up on deposit at their own bank. Actually, on average, new loans in the economy increases the available liquidity for these large banks, rather than decreasing it. The bank has therefore increased its assets and liabilities, resulting in balance sheet expansion. 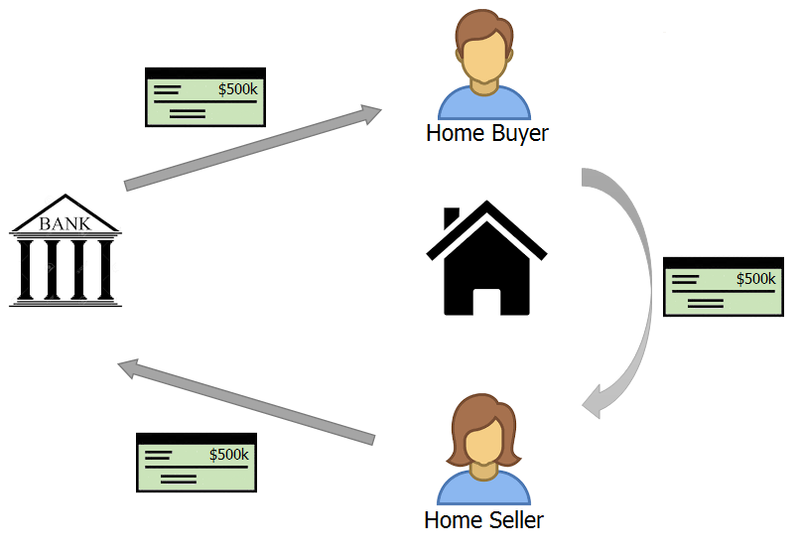 Although from the point of view of the home seller, she has $500,000 of cash. The above transaction has increased the amount of loans and deposits in the economy. From the customer’s point of view, these deposits are seen as “cash”. In a sense, new money has been created from nothing, apart from perhaps the asset, which in this case is the property. In the above scenario, M0 or base money, the total value of physical notes and coins in the economy, as well as money on deposit at the central bank, remains unchanged. M1, which includes both M0 and money on deposit in bank accounts, has increased by $500,000. Although the precise definition of M1 varies by region. Cash reserves from the point of view of a bank are physical notes and coins, as well as money on deposit at the central bank. The ratio between the level of deposits a bank can have and its reserves, is called the “reserve requirement”. This form of regulation, managing the reserve requirement, leads to the term “fractional reserve banking”, with banks owing more money to deposit customers than they have in reserve. However, contrary to conventional wisdom, in most significant western economies, there is no regulation directly limiting the bank’s ability to make these loans, with respect to its cash reserves. The reserve requirement ratio typically either does not exist, or it is so low that it has no significant impact. There is however a regulatory regime in place that does limit the expansionary process, these are called “capital ratios”. The capital ratio, is a ratio between the equity of the bank and the total assets (or more precisely risk weighted assets). The bank can therefore only create these new loans (new assets) and therefore new deposits (liabilities), if it has sufficient equity. Equity is the capital investment into the bank, as well as accumulated retained earnings. For example if a bank has $10 of equity, it may only be allowed $100 of assets, a capital ratio of 10%. The view that the credit cycle, caused by fractional reserve banking, is the dominant driver of modern economies, including the boom and bust cycle, is likely to be popular in the Bitcoin community. This theory is sometimes called Austrian business cycle theory, although many economists outside the Austrian school also appreciate the importance of the credit cycle. The above dynamic of credit expansion and fractional reserve banking, is not understood by many. 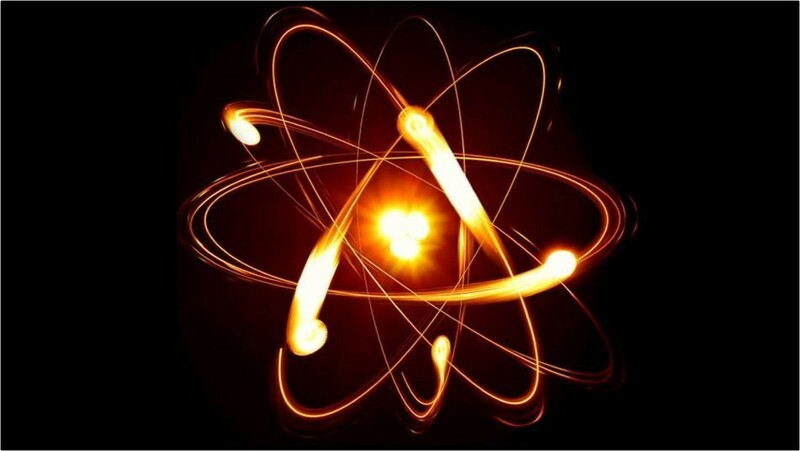 However, with the advent of the internet, often people on the far left politics, the far right of politics or conspiracy theorists, are becoming partially aware of this dynamic, perhaps in an incomplete way. With the “banks create money from nothing” or “fractional reserve banking” narratives gaining some traction. The question that arises, is why does the financial system work this way? The underlying reasons for this, are poorly understood, in our view. Individuals with these fringe political and economic views, may think this is some kind of grand conspiracy by powerful elite bankers, to ensure their control over the economy. For example, perhaps the Rothschild family, JP Morgan, Goldman Sachs, the Bilderberg Group, the Federal Reserve or some other powerful secretive entity deliberately structured the financial system this way, so that they could gain some nefarious unfair advantage or influence? Actually, this is not at all the case. The ability of deposit taking institutions to expand credit, without requiring reserves, is the result of inherent characteristics of the money we use and the fundamental nature of money. This is because people and businesses psychologically and for very logical practical reasons, treat bank deposits in the same way as “cash”, when they could alternatively be considered as loans to the bank. This enables banks to then expand the amount of deposits, knowing they are safe, as customers will never withdraw it, since they already think of it as cash. Bank deposits are treated this way for perfectly reasonable and logical reasons, in fact bank deposits have some significant advantages over physical cash. Bank deposits are simply much better than physical cash. It is these inherent and genuine advantages that cause fractional reserve banking, not a malicious conspiracy, as some might think. Despite the strong advantages of bank deposits mentioned in part 1 of this piece, namely the ability to use it electronically, physical notes and coins do have some significant benefits over electronic money. The following table aims to summarize the main features of the different types of money, bank deposits, physical cash and Electronic Cash (Bitcoin). Transfers can occur instantly ? ? Payments can occur 24×7 ? Transaction fees are zero ? Funds can easily be secured to prevent theft ? Due to the strengths mentioned in the above table, physical cash will always have its niche use cases. 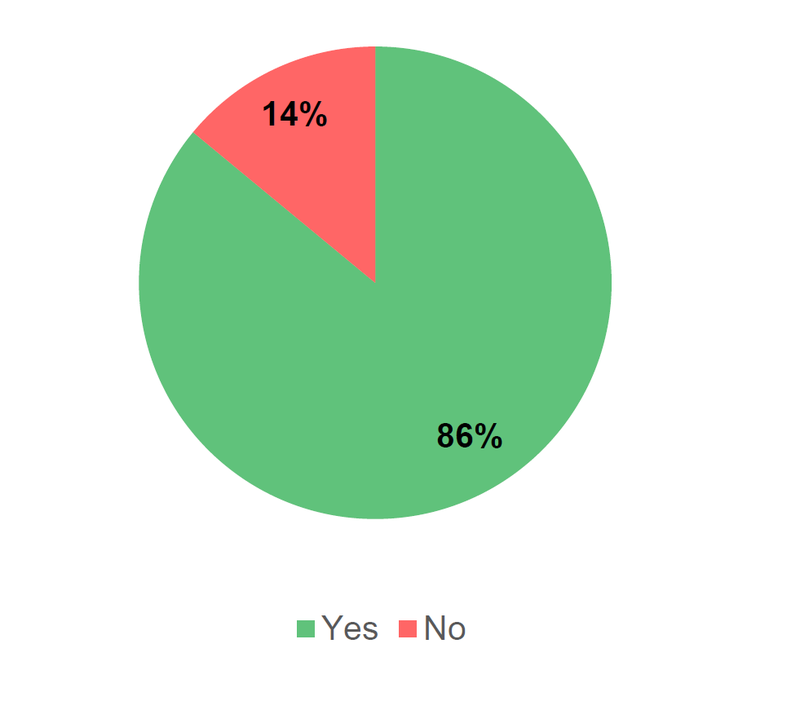 However, on balance, banking deposits are superior to physical cash, for the majority of users. The ability to use bank deposits electronically is particularly compelling, especially in the digital age. As we explained in part one of this piece, it is this ability to use the money electronically that ensures there is always high demand for bank deposits, giving banks the ability to freely expand the level of credit. 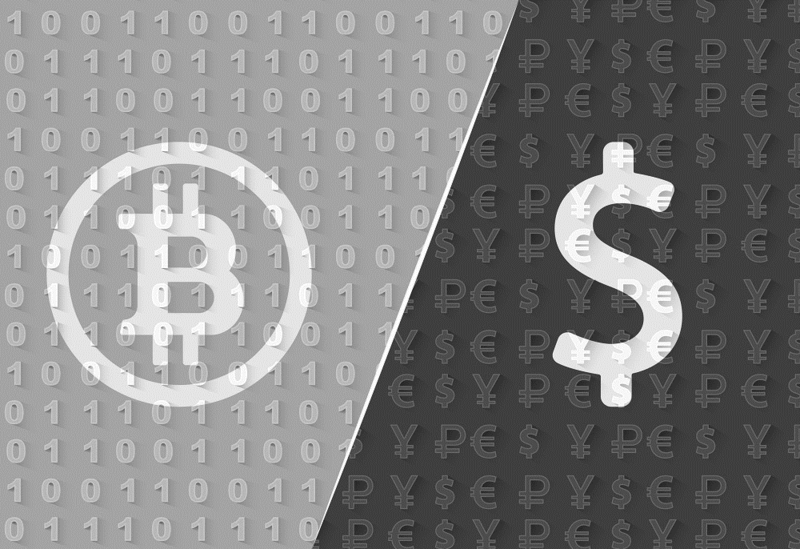 Bitcoin shares many of the advantages of physical cash over electronic bank deposits. Although Bitcoin does not have the full set of advantages, as the table above demonstrates. However the key unique feature of Bitcoin, is that it has both some of the advantages of physical cash and the ability to be used electronically. Bitcoin aims to replicate some of the properties of physical cash, but in an electronic form, an “electronic cash system”. Before Bitcoin, people had to make a binary choice, between physical cash or using a bank deposit. Although technically physical cash is a kind of a bank deposit, a deposit at the central bank, physical cash still has unique bearer type properties which could not be replicated in an electronic form. For the first time ever, in 2009, Bitcoin provided the ability to use a bearer type asset, electronically. The simple table below illustrates this key unique feature of Bitcoin and blockchain based tokens. Therefore Bitcoin can be thought of as a new hybrid form of money, with some of the advantages of physical cash, but also some of the advantages of bank deposits. Although Bitcoin has inherited some of the strengths of both traditional electronic money systems and physical cash. Typically Bitcoin does not have all the advantages of either electronic money or physical cash, however it is uniquely positioned to be able to have a subset of the features of each. This provides a new middle ground option. For example, Bitcoin may never have the throughput of traditional electronic payment systems or the ability to use without electricity such as with physical cash. Although as technology improves, Bitcoin may slowly develop more strengths and gradually improve its capabilities, to narrow the gap. Understanding the dynamics of these characteristics, can be useful in evaluating the potential economic significance of Bitcoin, should the ecosystem grow. Bitcoin has at least six properties which provide some level of natural resilience against credit expansion, which traditional money does not have. This is because the advantages of keeping money on deposit at a bank are not always as pronounced in Bitcoin, compared to the alternatives. However, Bitcoin is certainly not immune to the same credit expansionary forces which exist in traditional systems, indeed people can keep Bitcoin on deposit at financial institutions just like they can with physical cash. Bitcoin may merely have greater resistance to the same credit expansionary forces. At the core of our reasoning, is looking at the advantages of bank deposits compared to physical cash, which are the characteristics that enable large banks to freely expand credit and evaluating to what extent they apply in Bitcoin. As the table below shows, the advantages of keeping money on deposit at a bank are less significant in the Bitcoin world, therefore we think Bitcoin does have some unique resilience against the forces of credit expansion. Using the banking system, it is possible to send money effectively over the internet or by phone, across the world at low cost. Using a banking system to manage your money, can result in a convenient set of tools. For example the ability to use money using your mobile phone or your computer. Banks offer the ability to track and monitor all transactions, which can help prevent fraud and improve accountability. Bitcoin allows for a wider spectrum of deposit and security models, resulting in a more complex credit expansionary dynamic. The consequences of the lower level of credit expansion this analysis implies, does not really say much about whether this potentially new economic model will be more beneficial to society, nor does it say much about whether Bitcoin will be successful or not. The former is something that has been heavily debated by economists for decades and the latter is a separate topic, in our view. Although, despite decades of economic debate, perhaps Bitcoin is sufficiently different to the money which came before it, such that the debate is required again, with new very different information. For example inflation or deflation, caused by cycles of credit expansion, may have very different consequences in a Bitcoin based financial system, than on one based on bank deposits and debt. A key problem with deflation in a debt based money system, is that it increases the real value of debt, resulting in a downwards economic spiral. For non debt based money systems like Bitcoin, it is less clear what the implications of deflation are. Although Bitcoin may not necessarily result in a superior economic model, we think this analysis may suggest that Bitcoin may have some properties that make the economic model somewhat unique or perhaps interesting, compared to the possible models that came before it. Therefore it does look like an area worth examining. To many, the ultimate objective of Bitcoin is to become sufficiently dominant, such that there is a significant decrease in credit expansionary forces, which can neutralize the credit cycle and therefore the business cycle. Although, this should be considered as an extremely ambitious objective, which we consider as extremely unlikely. And even in the remarkable circumstance that Bitcoin grows to this scale, other unforeseen economic problems, particular to Bitcoin, may emerge. Abstract: Cryptocurrency prices have fallen significantly in the past few weeks. In this note, we analyse the impact this price decline may have on the mining industry. 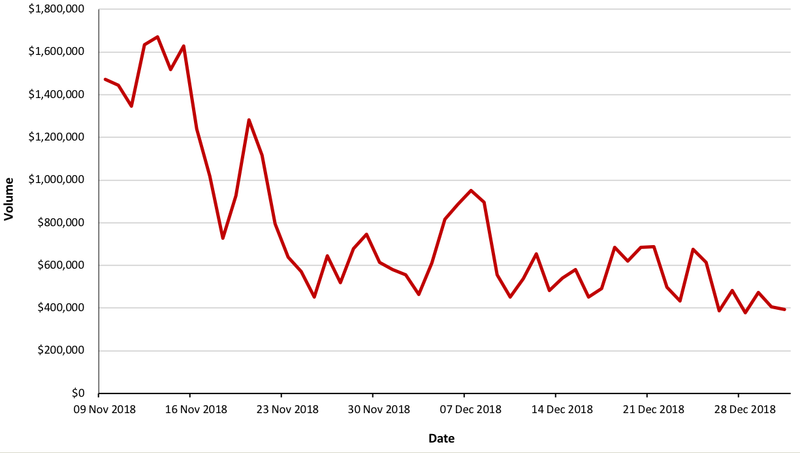 The Bitcoin hashrate has fallen around 31% since the start of November 2018, equivalent to around 1.3 million Bitmain S9 machines. We conclude that many miners are struggling; however, we point out that not all miners have the same costs and that it’s the higher cost miners who switch off their machines first, as the price declines. 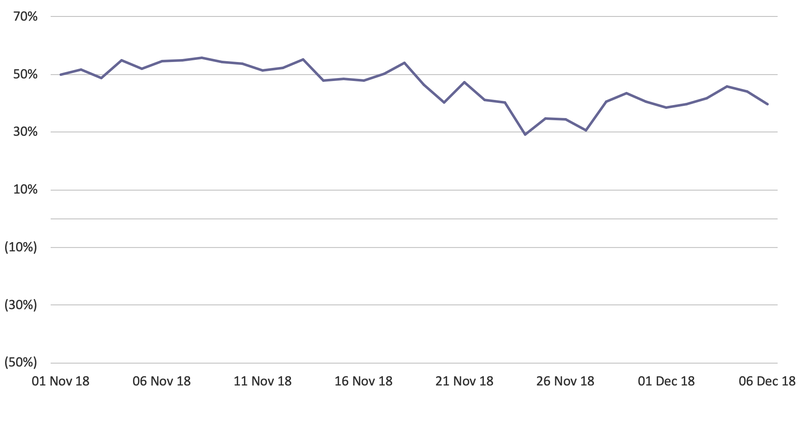 Since the start of November 2018, the Bitcoin price is down around 45%, while in the same period the amount of mining power on the Bitcoin network has fallen by around 31%. According to our estimates, this represents around 1.3 million Bitmain S9 miners being switched off. The mining industry may therefore be under considerable stress right now, due to the falling prices of cryptocurrency. The prices have so far caused two large downward difficulty adjustments to Bitcoin, 7.4% and 15.1%, on 16th November and 3rd December, respectively. The 7.4% adjustment was the largest since January 2013 and the 15.1% adjustment was the largest since October 2011. The charts below are based on the daily chainwork and therefore reflect changes in network difficulty. As the chart below illustrates, Bitcoin mining industry revenue has fallen from around $13 million per day at the start of November to around $6 million per day, at the start of December. This drop in incentives was even larger than the fall in the Bitcoin price, due to a delay in the way difficulty adjusts. 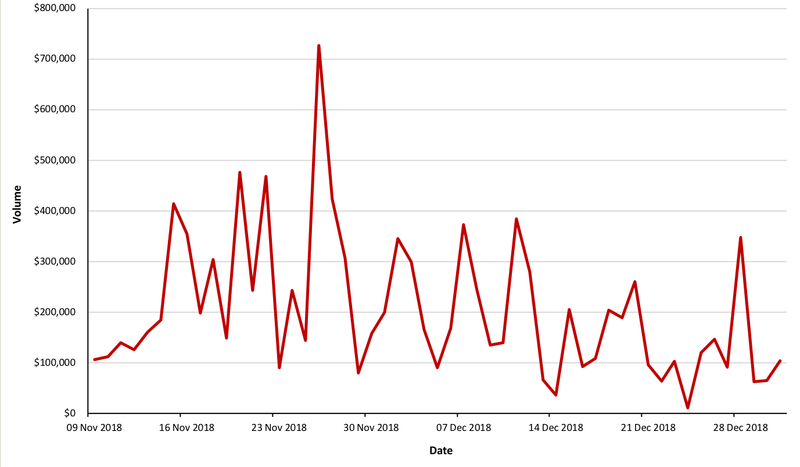 In the six-day period ending 3rd December, 21.8% fewer blocks than the expected 144 per day were found, as miners left the network before the difficulty adjusted, and as a result, fewer blocks were found. Therefore in the short term, there was a 21.8% fall in mining incentives on top of the impact of the declining price. The chart below shows that prior to the recent crash, the industry was making gross profit margins of around 50% (these figures assume electricity is the only cost included in gross profits), while after the price crash, this fell to around 30% for Bitcoin and 15% for Ethereum. In the period, the Ethereum hashrate has only fallen by 20%, much lower than Bitcoin, (representing around 1.5 million high-end graphics cards), while the price decline has been more significant than Bitcoin, at 54%. 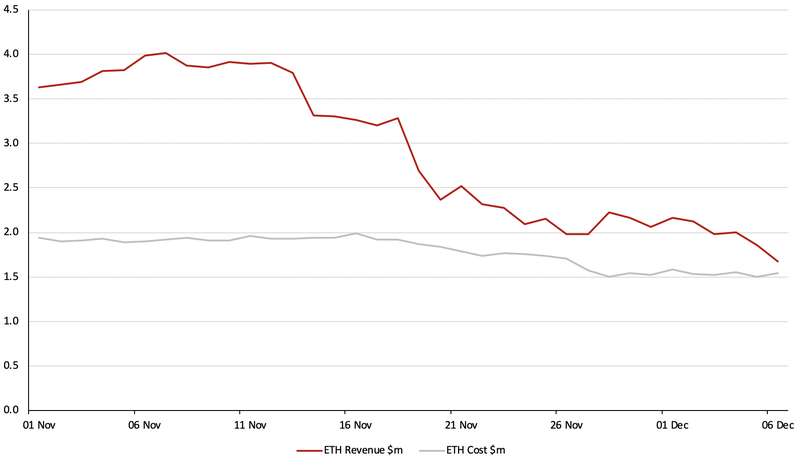 Therefore, gross profit margins have declined even more sharply for Ethereum, but it is not clear exactly why this is the case. There are a few potential reasons. It could be that Ethereum miners are more hobbyist minded and less profit focused, or Ethereum miners could have started from a higher gross profit margin position than Bitcoin, so they are less inclined to monitor the network and switch the miners off when necessary. As the data shows, Ethereum miner gross profit margins now appear significantly lower than Bitcoin, falling to 15% in the last few days, so this could change (Note: This analysis only included electricity costs, when including other costs, mining may be a loss making operation). 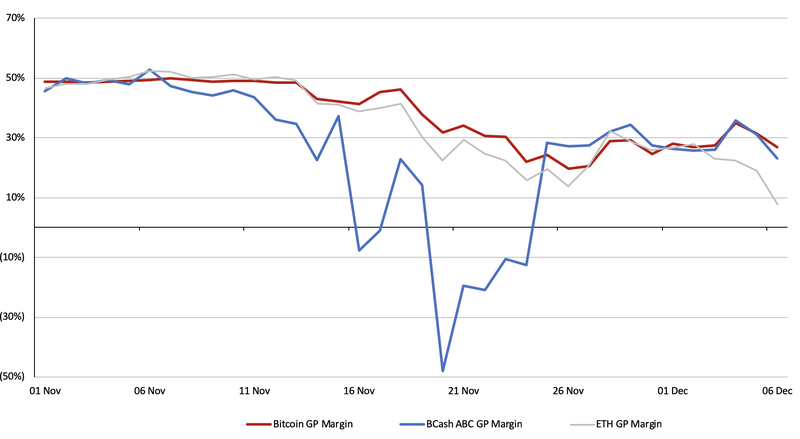 As the above chart shows, the Bitcoin Cash ABC gross profit margin went negative during the split into two coins, Bitcoin Cash ABC and Bitcoin Cash SV. The two camps mined uneconomically in a race to have the most work chain. Ten days after the split, on 25th November, the profitability of mining Bitcoin Cash ABC rapidly climbed up to around the same levels as Bitcoin. This appeared to indicate the end of the “hashwar,” which proved to be almost completely pointless, as the war ending had no clear noticeable impact on either the coins or their value. As the latest data in the below table shows, the two sides are getting closer again with respect to total work since the split and its possible uneconomic mining resumes. The above gross profit margin charts do not show a complete picture. 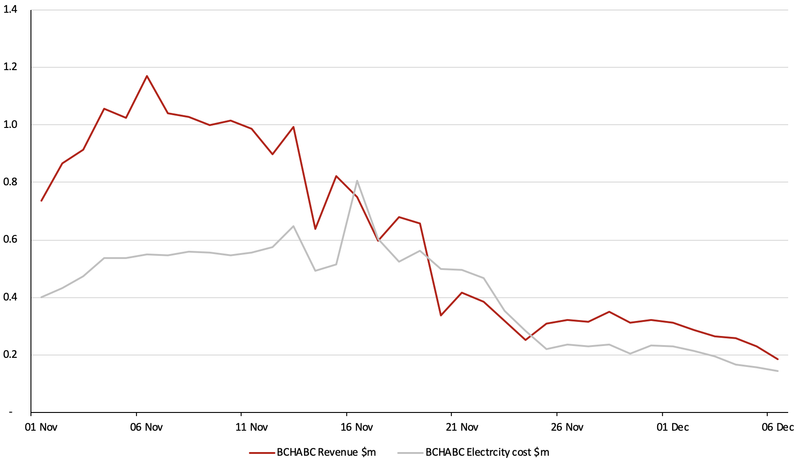 While the revenue figures are likely to be accurate, the only cost included is electricity. Obviously miners have other costs, such as the capital investment in the machinery as well as maintenance costs and building costs. 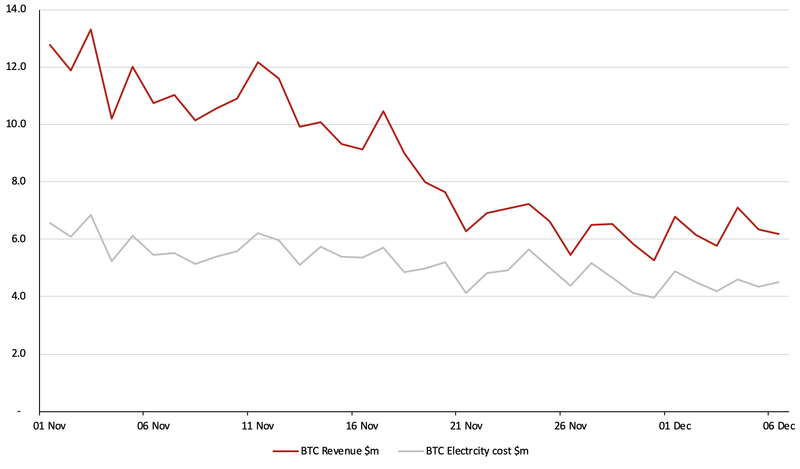 Therefore, although the charts below show that the industry is highly profitable when only considering electricity costs, given other costs, the recent price crash is likely to have sent almost all the miners into the red. 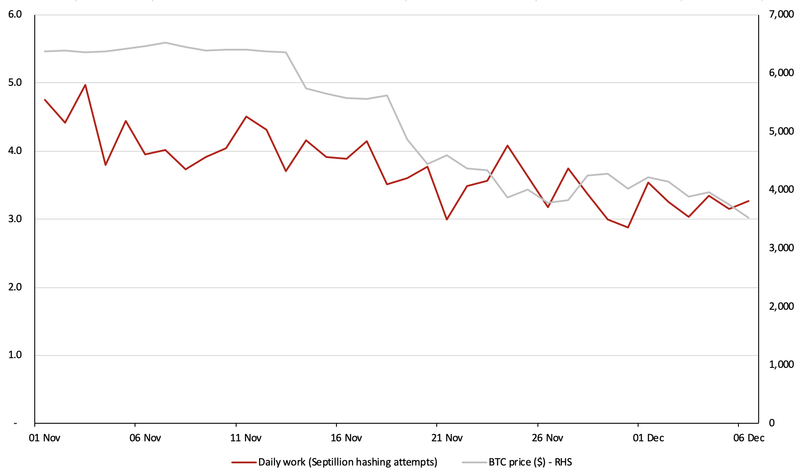 This indicates that miners invested too much in equipment and have achieved large negative ROIs. Another crucial point not reflected in the above analysis is the variance in electricity rates. The charts above assume a flat cost of $0.05 cent per KwH; however, not all miners have the same electricity costs and there will be a distribution. As we mentioned above, 31% of the hashrate was shutdown in the period, logically those with the highest electricity costs should turn off their machines first. Therefore the average electricity cost on the network should have fallen considerably in the past month. The below chart is an illustration of the above, it assumes that electricity costs are normally distributed with a standard deviation of $0.01 per KwH and that higher-cost miners switch their machines off first. Although this assumption is likely to be highly inaccurate and energy prices will not be normally distributed across the mining industry, from a macro level it illustrates a point and it may be more accurate than the above chart. According to this analysis, average Bitcoin mining gross margins have only declined from around 50% to 40%, implying a far more healthy situation for the remaining miners. When evaluating the potential negative impact of price declines on Bitcoin, analysts sometimes forget that not all miners have the same costs. It is these cost variances that should ensure the network continues to function smoothly despite large sudden price declines and allows the difficulty to adjust. What Caused the Price Crash? There has been considerable speculation around the causes of the price crash, with some saying miners sold Bitcoin in order to finance a costly hashwar in Bitcoin Cash. The cryptocurrency intelligence monitoring platform Boltzmann flagged to us that their platform had detected unusually large miner selling of Bitcoin on 12th November, a few days before the Bitcoin Cash split. Boltzmann detected that net Bitcoin sales from miners were “17.5 standard deviations below [the] 3-month trailing average.” On further analysis, it appears these miners may have been a member of Slushpool. While it may be true that mining pools selling Bitcoin to fund losses in the Bitcoin Cash hashwar may have been a catalyst for the reduction in the price, we think it’s easy to overestimate the impact of this. We are in a bear market and prices are falling regardless of the news or investment flows. Furthermore, in a bear market prices seem to fall on non-news or bad news and ignore good news, while in a bull market the reverse appears true. We think it’s likely that prices would have been weak regardless of any miner selling prior to the Bitcoin Cash split. For cryptocurrency, trader sentiment is king. Abstract: We evaluate Bitcoin Cash ABC’s new rolling 10 block checkpoint system. The new system does defend against “deep” hostile reorgs; however, it increases the risk of consensus chain splits and provides new opportunities for a would-be attacking miner. Another tradeoff is that the change increases the damage hostile miners can do to the network, but it reduces the potential reward for such behaviour. It is not clear at this point if this change is a net benefit, although it is a fundamental change to the system and it may therefore be better to spend more time assessing the dynamics involved before the network adopts this technology. 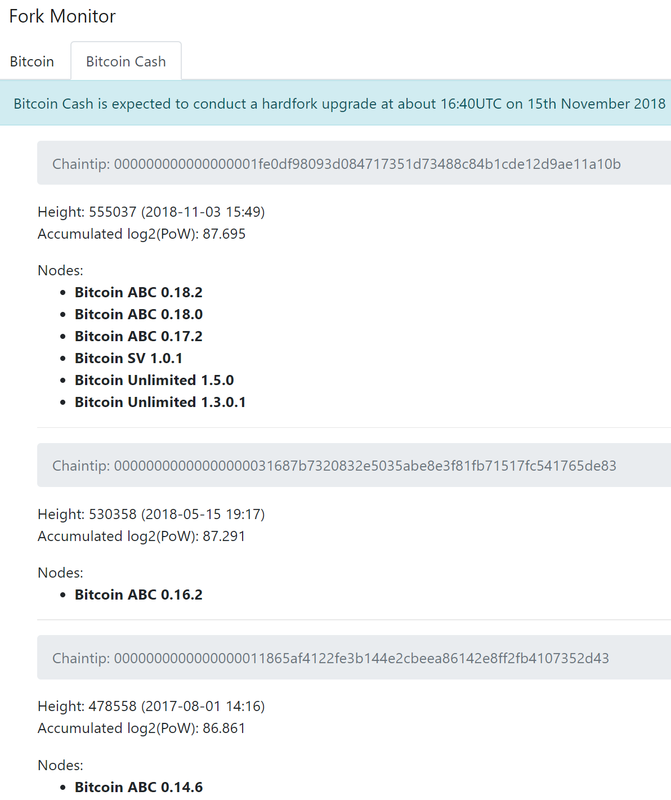 Bitcoin Cash ABC added a new rolling checkpoint system in software version ABC 0.18.5, which was released on 21st November 2018. Essentially, the new mechanism finalizes a block once it has received 10 confirmations, which prevents large blockchain reorgs. Therefore even if an alternative chain has more proof of work, if it conflicts with a checkpoint, the node will not switch over to the most work chain. This feature may have been added as a defence against potential attackers including from supporters of the rival Bitcoin Cash SV chain, who have indicated they may wish to attack Bitcoin Cash ABC. The risk of a deep reorg is reduced. The risk of a consensus chainsplit is increased. It it unlikely that latency problems will cause nodes to be out of sync with each other by 10 blocks, therefore, this is largely a non-issue, in our view. The new checkpointing system is therefore not likely to cause problems here. Although with a block size of up to 32MB, there could be some latency issues in a small number of circumstances and it is possible nodes could be out of sync by 10 blocks. The checkpoint doesn’t seem to solve any issues to do with latency. If latency issues cause a 10 block reorg, the user may want to follow the most work chain. Therefore we do not think there is any benefit here. The risk of a deep hostile reorg is now reduced or limited to 10 blocks. In the unlikely scenario that poor network connectivity causes nodes to be out of sync with each other by 10 blocks or more, the conflicting checkpoints could cause a consensus split resulting in two or more coins. Although the reorg risk is now reduced, the hostile miner now has a new attack vector. The attacker can attempt to mine a 10 block long (or longer) chain in secret and then publish the chain at a time designed to cause conflicting checkpoints on the network, causing a chain split. As indicated above, if a hostile miner is producing a shadow chain, once this diverges from the “honest” chain by more than 10 blocks, it is essentially useless as it cannot reorg the honest chain, even if it has more work. Therefore the attacker might as well give up and stop extending the shadow chain. However, this also means that as soon as the 10th block since the split has been produced on the “honest chain,” the attacker might as well publish the shadow chain at this point, depending on the attacker’s objectives. (i.e. release the shadow chain as soon as the attacker receives the block in red indicated in the below diagram.) This could then cause a consensus chain split, with some nodes having received the red block first and some receiving the shadow chain first, resulting in conflicting checkpoints. This attack may cause a consensus chain split, which could be just as damaging to the network as continuing on to do a hostile reorg. It is also cheaper than continuing on to do a deep reorg, since the hostile miner can stop earlier. Therefore it is not clear to us why this new checkpointing defence is a material improvement. Although the risks in this section are unlikely to materialise (and could require the attacker to have a majority of the hashrate), they seem at least as likely to occur as the problem the new checkpointing system is trying to mitigate against. Although the new checkpointing mechanism may have a limited impact on security within a 10 block window, when looking back more deeply from the current chain tip, security may be increased over longer timeframes. This may be very useful to some exchanges or merchants who can now wait for more than 10 blocks before crediting a user account and achieve a higher level of assurance. However, a key focus of Bitcoin Cash is to increase transaction speeds, so this benefit may not be desirable for the Bitcoin Cash community. Although a new attack vector is opened up by this mechanism, providing a new way for hostile miners to instigate a consensus split as we explained above, the incentive to do this is less clear than for a “normal” deep reorg attack. A normal reorg attack can be used to initiate a double spend against an exchange, whereby the attacker could profit. While it is possible to also attempt a double spend attack using this new chain split-related attack vector, the outcome is less clear, as it is not obvious which side (if any) will be the winner or which chain an individual exchange may follow. Therefore, although this attack is potentially more devastating on the network, the incentives for it are less obvious. We view this as a significant positive. Another common criticism of checkpoints is that it gives developers more power and increases centralisation since developers normally manually insert the checkpoints when they release new versions of the software (like Bitcoin used to have). However in our view, this does not apply in this case as the checkpoints are automatically generated by the node software and not manually generated by the development team. Therefore this a non-issue. As Eric Wall explained on Twitter, the new checkpoint mechanism opens up the ability to sybil attack nodes not on the latest chaintip. For example, nodes still in the initial sync or nodes related to users who temporarily shut down their nodes for several days. An attacker needs to launch his own relay nodes and generate a new 10 block long chain at any point in the past. This lower work chain can then be broadcast to nodes (including the specific targeting of nodes not at the current tip), potentially causing these nodes to conduct the checkpoint prematurely, on an alternative chain. Not only does this leave these nodes on a different chain, but this chain is under the control of the attacker. This seems to be a significant flaw of the checkpointing system. Nodes can leave and rejoin the network at will, accepting the proof-of-work chain as proof of what happened while they were gone. To some extent this Bitcoin Cash ABC upgrade abandons that philosophy, and requires nodes to be online 24×7. The new Bitcoin Cash ABC checkpointing system is a fundamental change to the core network and consensus dynamics, resulting in a number of trade-offs. These changes may not have been adequately explored before the upgrade. Although we do not think it is likely such a change will result in an immediate crisis, it’s not likely to prevent one either. 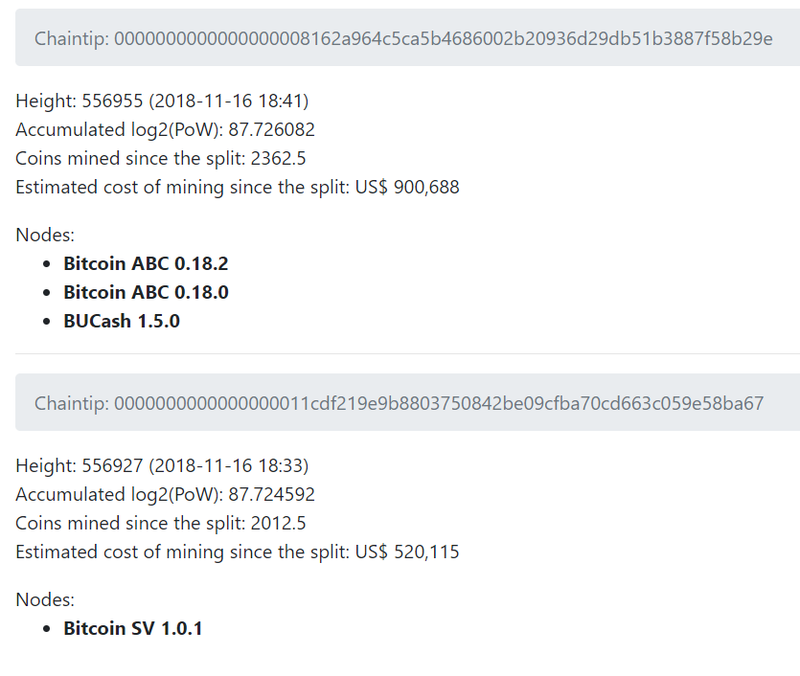 Abstract: Bitcoin Cash successfully split into two coins on 15th November 2018, Bitcoin Cash ABC and Bitcoin Cash SV. BitMEX Research sponsored a website, forkmonitor.info to track the two chains. There is now a “hashrate war” between the two coins and the hashrate is higher than one would expect given the price of the coins, such that miners are making large losses. The website has now been updated to help estimate the value spent mining on each side of the split and the loses miners may therefore be making. Although the table above shows that both sides are making losses, it illustrates why the ABC side may be in a stronger financial position than SV. Not only is ABC in the PoW lead (both with respect to the number of blocks and accumulated work), but the SV miners have larger expected losses than ABC miners, due to the lower price of the SV coin. The SV losses are also larger relative to the potential revenue, with a profit margin of minus 166.4% compared to ABC on minus 45.5%. Despite this situation, one should of course be aware that the prices of these coins are volatile and highly uncertain. There is no guarantee that either side will be able to sell the coins they mined. However, the ABC side does have a reasonably liquid futures market. Mining is currently continuing on both sides, with neither side willing to back down over the fight for the most work chain. Despite the bleak financial situation, the rhetoric on the SV side remains strong, with Coingeek stating that they may be prepared to keep this up for “months and months”. However, with just around 24 hours passing since the split and SV miners already US$324,904 in the red, using our conservative assumptions, we would be surprised if the situation continues like this for months. While the rhetoric from either side is strong, in a way the hashrate battle is totally pointless. Users and investors are free to choose the ABC or SV side of the split no matter which chain has the most blocks or highest accumulated work. The narrative of being the higher work chain appears important to proponents of the two coins, but the prudent think to do would be to step back and mine the most profitable coin. In our view, as the accumulated losses gradually start to increase, it is inevitable that the parties involved step back and allocate the hashrate such that its distributed in a proportional way to the prices of each coin. How long this will take, we do not know, but the forkmonitor.info website should provide a useful tool. It can help asses the extent to which financial pressure is building on each side in this somewhat pointless hashrate war. Abstract: We present an in depth report into the cryptocurrency exchange ecosystem. The market is broken down by almost all the possible characteristics (Exchange type, exchange region and trading pairs). The robustness and authenticity of exchanges are evaluated using metrics such as web traffic, average trade sizes, order book depth, security polices and price reliability. 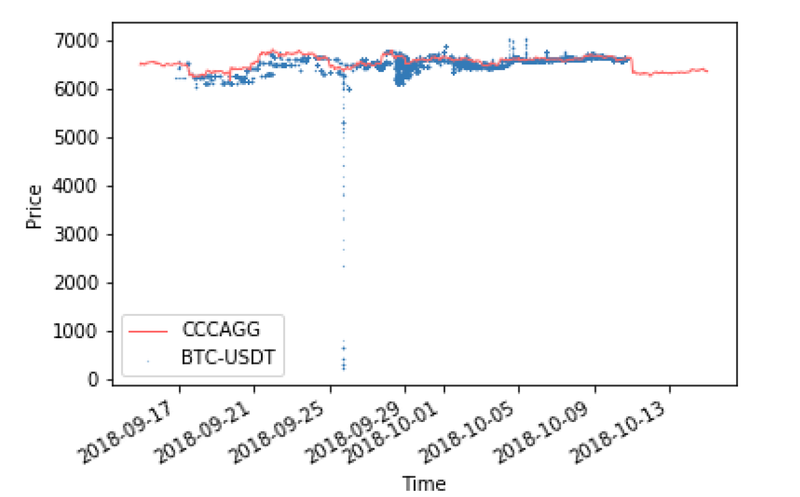 The report was produced by CryptoCompare and uses the CryptoCompare’s Aggregate Pricing Index (the CCCAGG), for much of the analysis. Bitstamp was acquired by Belgium-based Investment Firm NXMH for ~400 million USD according to reports. Cryptoassets on Gemini are now fully insured with Aon. Coinbase adds 0x to its trading platform as well as USDC after announcing its collaboration with Circle on the CENTRE Consortium. Korean exchange Bithumb starts a new DEX, while Huobi and OKEX list stablecoins GUSD, TUSD, PAX and USDC. Coinfloor becomes the first exchange to obtain a Gibraltar license. 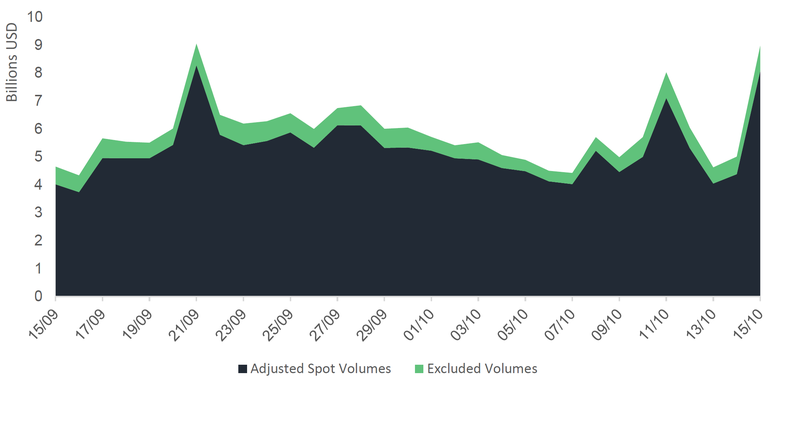 Spot volumes constitute less than three quarters of total market volumes on average (less than 7 billion USD) compared to futures volumes (3.2 billion USD). 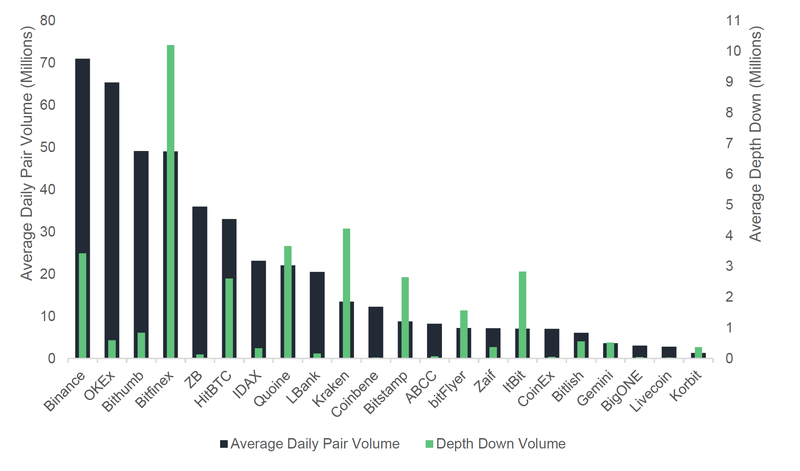 BitMEX and BitflyerFX average more than one quarter of total volumes while traditional exchanges such as CME and CBOE constitute just under 1%. Within total spot volumes, exchanges with taker fees represent approximately 90% of the exchange spot market volumes, while transaction-fee based and no-fee exchanges represent the remaining 10%. Exchanges that offer fiat to crypto pairs constitute just under a quarter of spot market volumes on average (~2 billion USD) while exchanges that offer only crypto to crypto pairs constitute approximately three quarters (~4.7 billion USD). In terms of exchange count however, approximately half of all exchanges offer fiat to crypto pairs. The top trans-fee mining exchange by average 24h volume was EXX (160 million USD), followed by Coinex (114 million USD) and Coinbene (113 million USD). The total average 24h-volume produced by trans-fee mining associated exchanges on CryptoCompare totals just over 550 million USD. This constitutes approximately 10% of total exchange volume over the last 30 days. The total average 24h-volume produced by the top 5 decentralized exchanges on CryptoCompare totals just under 2.4 million USD. This constitutes just 0.4% of total exchange volume. The top 3 on CryptoCompare by 24h volume include Waves Dex, IDEX and Dex. Binance remains the top exchange in terms of 24h volume with an average of 977 million USD. This is followed by OKEX (405 million USD) and Bitfinex (368 million USD). Yobit offers the highest number of pairs at 7,032, followed by Cryptopia (4,321) and CCEX (2,140). 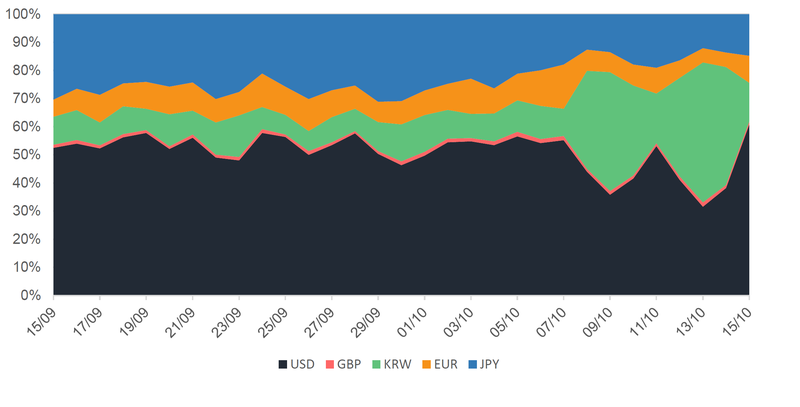 The US Dollar represented half of BTC fiat trading on average over the past 30 days, followed by JPY (21%) and KRW (16%). Bitcoin trading to Korean Won (KRW) increased sharply after the 7th of October. The pair previously represented a tenth of bitcoin trading among the top 5 fiats on average. Between the 7th and 15th of October it represented a third on average, a 230% increase stemming from Korean exchange Bithumb’s spike in trading volumes. Maltese-registered exchanges produce the highest total daily volume at just under 1.4 billion USD, followed by those based legally in South-Korea (~840 million USD) and Hong Kong (~560 million USD). 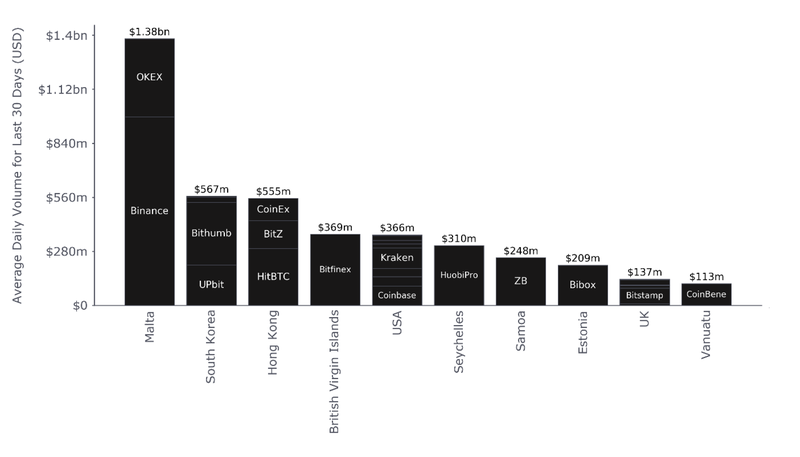 Among the top 10 volume-producing countries, the highest number of large exchanges (with significant volume) are based legally in the USA, the UK and Hong Kong. Binance and OKEX represent the vast majority of Malta’s volumes, while Bithumb and Upbit dominate in South Korea. 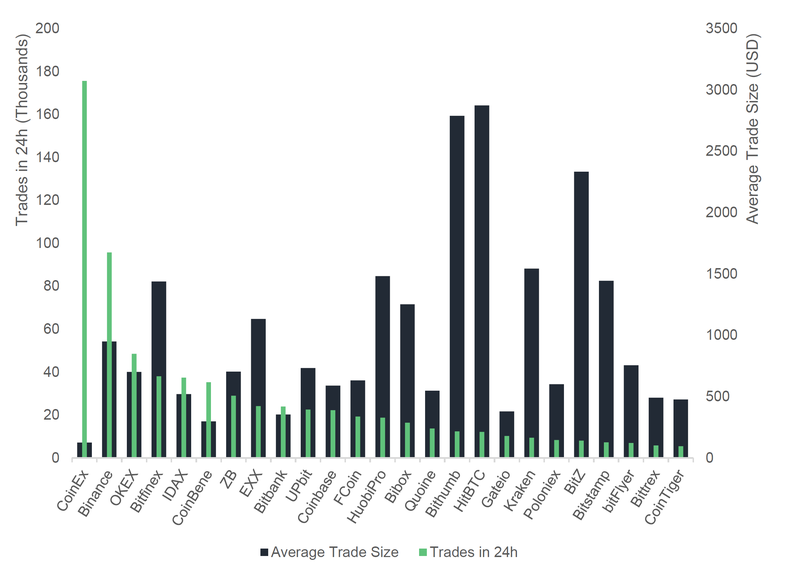 CoinEx, a well-known trans-fee mining exchange, has a significantly higher trade frequency and lower trade size than other exchanges in the top 25. This may point to algorithmic trading, given its almost 176 thousand trades a day at an average trade size of 125 USD. 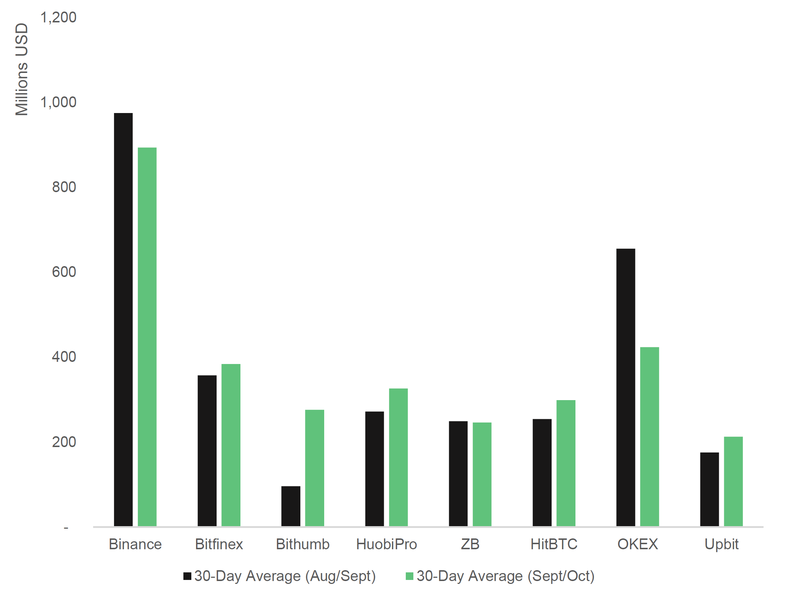 In contrast, Bithumb and HuobiPro had an average trade size of just under 3,000 and 1,500 USD respectively and significantly lower trades per day (12-18 thousand). IDAX and CoinBene appear to have lower average daily visitors compared to similarly sized exchanges by daily volume. Binance has the highest average daily visitor count, in line with its high trading volumes. Meanwhile, exchanges such as Coinbase, Cex.io and Bittrex have significantly greater numbers of daily visitors than other exchanges with similar daily volumes. ZB and EXX attract significantly lower daily visitors than similarly-sized exchanges. 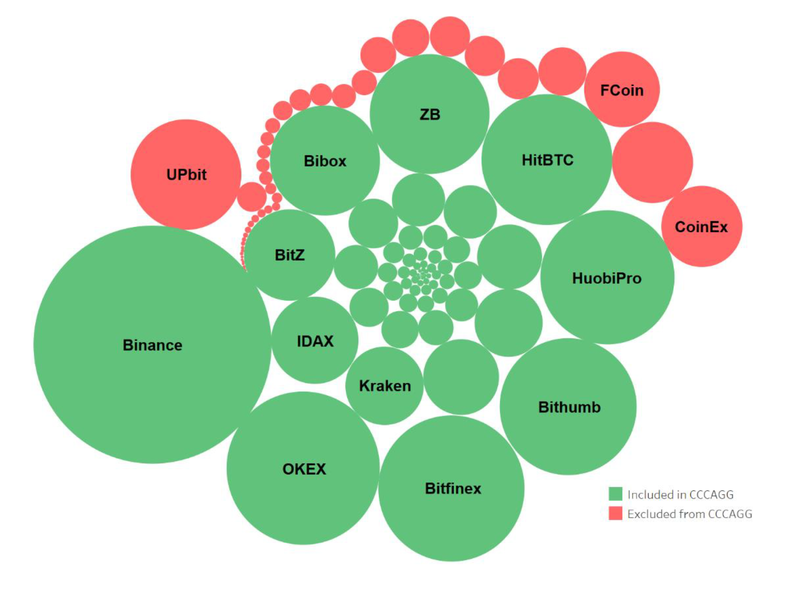 ItBit, Kraken and Bitstamp have relatively more stable markets compared to exchanges such as CoinEx, ZB and Coinbene. These exchanges appear significantly less stable given their relatively low average order book depth values over the specified period of analysis. Just under half of top exchanges impose strict KYC requirements, while more than a quarter do not require KYC. This section aims to provide a macro view of the cryptocurrency exchange market as a whole. An area of interest is the proportion of spot trading vs futures trading historically. We will also assess the relative proportion of exchange volumes that represent exchanges that charge fees, as well as those that implement models with no-fees or trans-fee mining. Finally, we will take a look at exchange volumes that represent crypto-crypto exchanges versus those that represent fiat-crypto exchanges. Spot volumes constitute three quarters of total market volumes on average. Total spot volume averaged less than 7 billion USD, while futures volume averaged over 3.2 billion USD over the period of analysis. Futures exchanges such as BitMEX (XBT to USD perpetual futures) and BitflyerFX (BTC to JPY futures) average just under a quarter of total cryptocurrency market volumes. Traditional exchanges such as CME and CBOE trading bitcoin futures, only constitute a very small proportion of the total market at just under 1% on average. 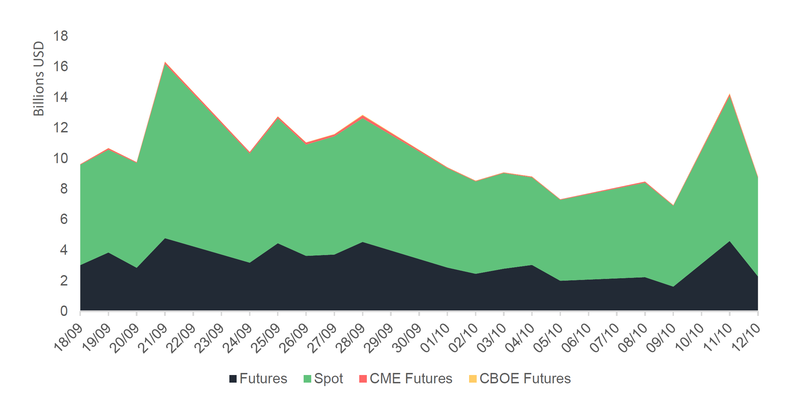 When compared to CME’s and CBOE’s futures volumes, BitMEX has represented an average of just over 90% of the market over the last month. Exchanges with taker fees represent approximately 90% of the exchange spot market volumes. On the other hand, exchanges that implement transaction-fee mining represent just over 9% of the total spot market, while those that offer no-fee spot trading represent just under 1% of the market. 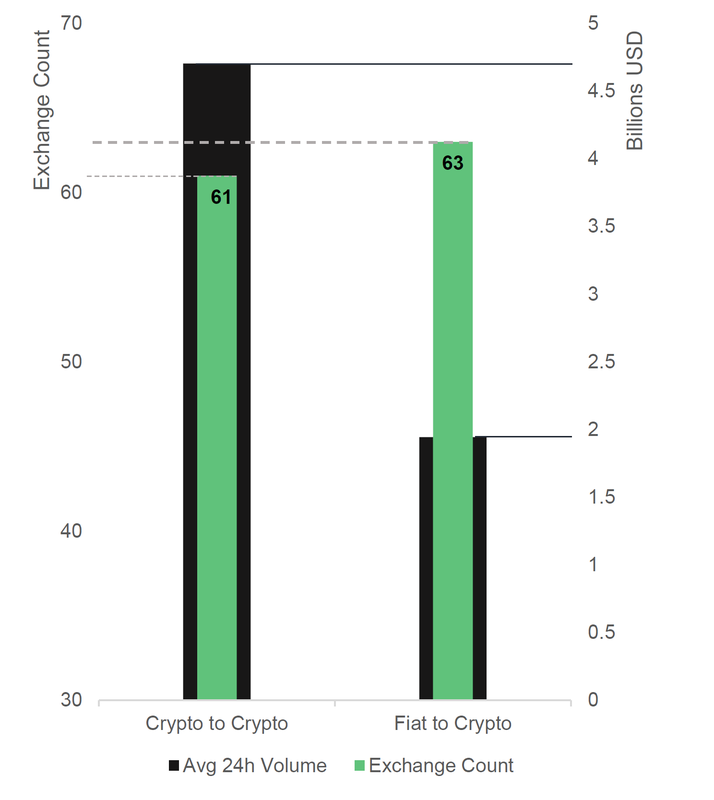 Exchanges that offer fiat to crypto pairs constitute just under a quarter of spot market volumes on average. The cryptocurrency exchange market trades an average of 5.26 billion USD in adjusted volumes over the period of analysis. Adjusted spot volumes exclude all exchanges that operate trans-fee mining or no-fee trading models. Bitcoin trading to Korean Wan (KRW) increased sharply from the 7th of October. 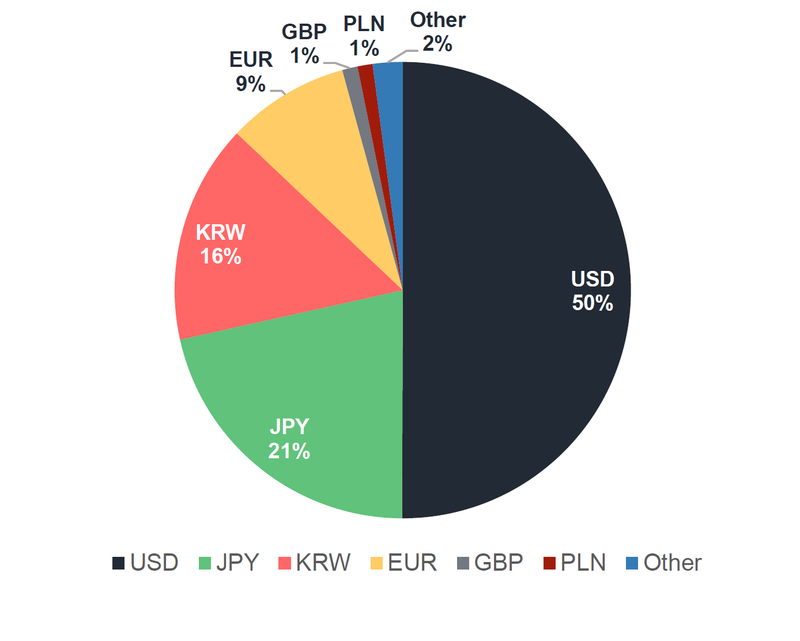 BTC to KRW previously represented a tenth of bitcoin trading among the top 5 fiats on average. Between the 7th and 15th of October it represented a third on average, a 230% increase. This increase stems from Korean exchange Bithumb’s spike in volumes. 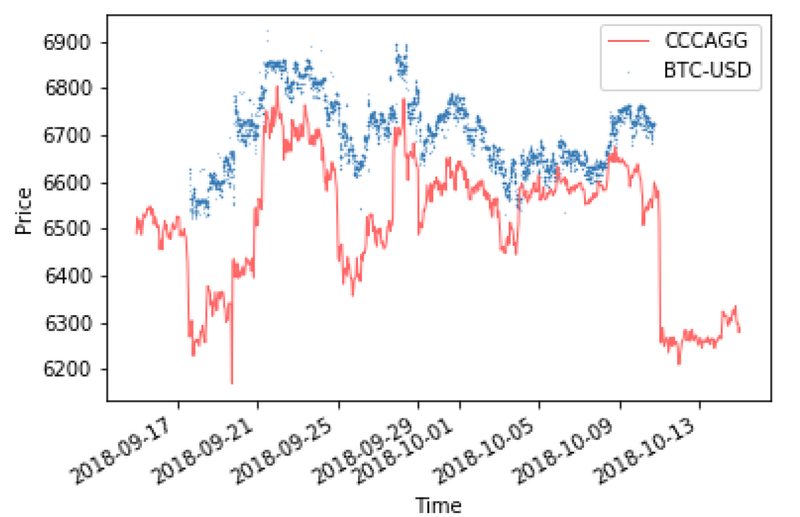 The US Dollar represented half of BTC fiat trading on average over the past 30 days, followed by JPY (21%) and KRW (16%). The top exchange by 24h spot trading volume was Binance with an average of just under 980 million USD. By average 24h volumes, Binance was followed by OKEX and Bitfinex with volumes of 405 million and 368 million respectively. Bithumb saw a 356% spike in trading volumes from an average of 140 million USD to an average of 640 million USD after the 7th of October. This follows after Singapore-based BK Global Consortium bought a controlling share in the exchange. Bitfinex saw a spike in volumes towards the 15th of October as the Bitcoin premium on Bitfinex vs Coinbase reached an all-time high of 11.28% according to CrypoGlobe. Korean exchange Bithumb saw a significant increase in average trading volumes from 96 million USD between August/September to 276 million between September/October. Meanwhile, Binance’s volumes over the same time period dropped from 974 million USD to 893 million USD. Finally, the 2nd largest exchange by 24h volumes, OKEX, saw trading volumes drop 655 million USD to 423 million USD. Exchanges maintain operations in a variety of countries, in order to serve the wider global community of cryptocurrency traders. They often change legal jurisdiction to avoid regulation in countries that might restrict their abilities to conduct business as they wish. 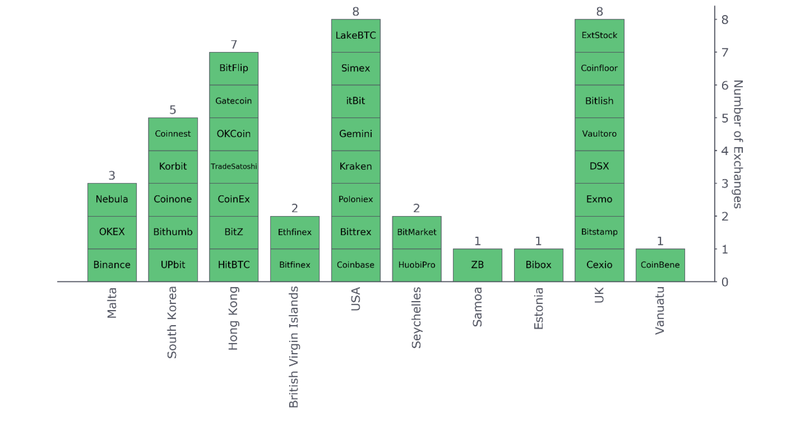 The following country analysis aims to highlight the top 10 legal jurisdictions by the total 24h volume produced by the top exchanges legally based in each jurisdiction. Maltese-based exchanges produced the highest total daily volumes, while the highest quantity of top exchanges are based in the USA and the UK. 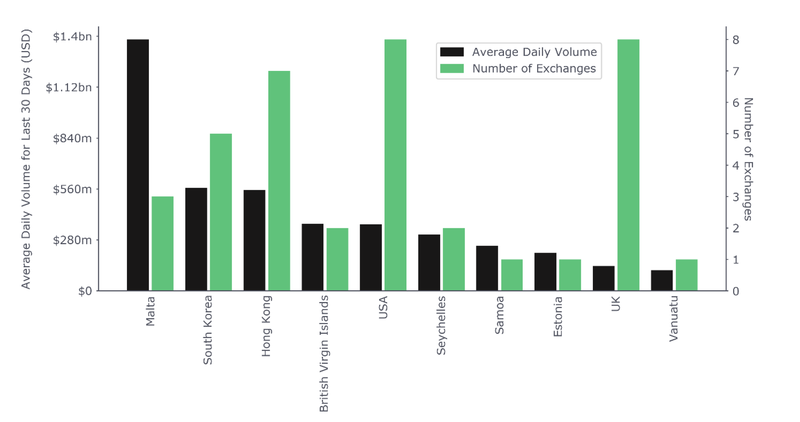 Maltese exchanges produce the highest total daily volume at just under 1.4 billion USD, followed by those based legally in South-Korea (~840 million USD) and Hong Kong (~560 million USD). Among the top 10 volume-producing countries, the highest number of exchanges (with significant volume) are based legally in the USA, the UK and Hong Kong. Binance and OKEX represent the vast majority of Malta’s volumes, while Bithumb and Upbit dominate in South Korea. Well-known USA-based exchanges include Coinbase, Poloniex, and itBit, while those in South Korea include Upbit, Bithumb and Coinone. Hong Kong exchanges include HitBTC, CoinEx and Bit-Z, while those in more remote jurisdictions include HuobiPro in the Seychelles, ZB in Samoa and Coinbene in Vanuatu. The following analysis aims to highlight both the total volumes produced by crypto-crypto vs fiat-crypto exchanges as well as the total number of exchanges that fall within each category. Those that that offer fiat-crypto pairs constitute only a quarter of the total exchange market (~2 billion USD) on average. In terms of exchange count, approximately half of all exchanges offer crypto-crypto. This analysis aims to shed light on the trading characteristics of given exchange. It helps to answer whether an exchange’s volumes might be the product of consistently large trades, or the product of many small trades which may suggest the use of algorithmic trading or bots. CoinEx, a well-known trans-fee mining exchange, has a significantly higher trade frequency and lower trade size than other exchanges in the top 25. This may point to algorithmic trading, given its almost 176 thousand daily trades at an average trade size of 125 USD. 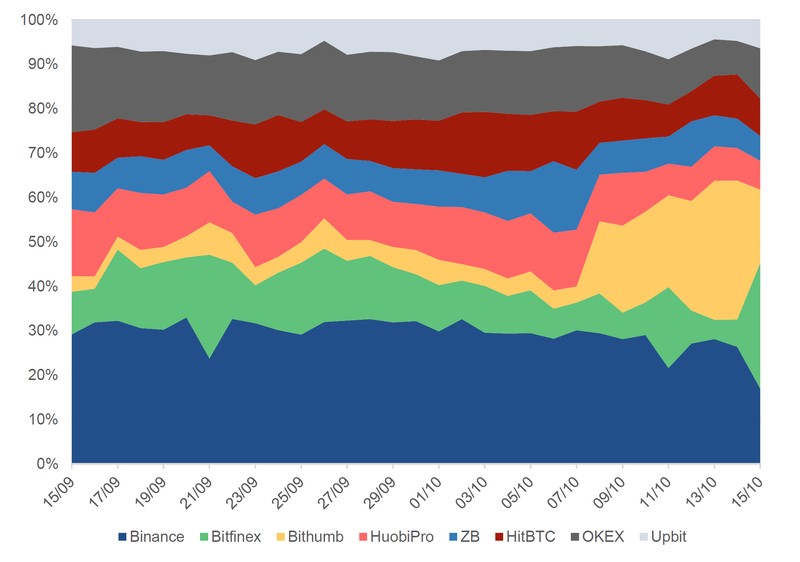 In contrast, Bithumb and HuobiPro had an average trade size of just under 3,000 and 1,500 USD respectively. This analysis examines the web traffic stats of the top exchanges within CryptoCompare’s total pool of exchanges. It is based on similar studies that have attempted to make a connection between the number of unique web users per domain and the subsequent 24h trading volume for that specific domain. This analysis assumes that the more unique visitors an exchange attracts, the higher its trading volume. IDAX and CoinBene appear to have lower average daily visitors compared to similarly sized exchanges by daily volume. The figure above represents the top exchanges by volume that have an Alexa ranking above 100,000. The reason for this is that according to Alexa, any ranking below this may not be statistically significant. 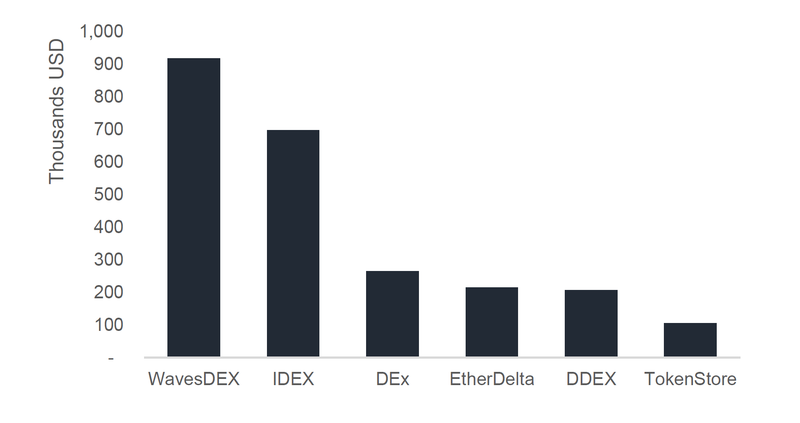 What we can see that exchanges such as IDAX and CoinBene have lower Average Daily Unique Visitor numbers than other exchanges with similar volumes such as Kraken, Bitstamp, and CoinEx. 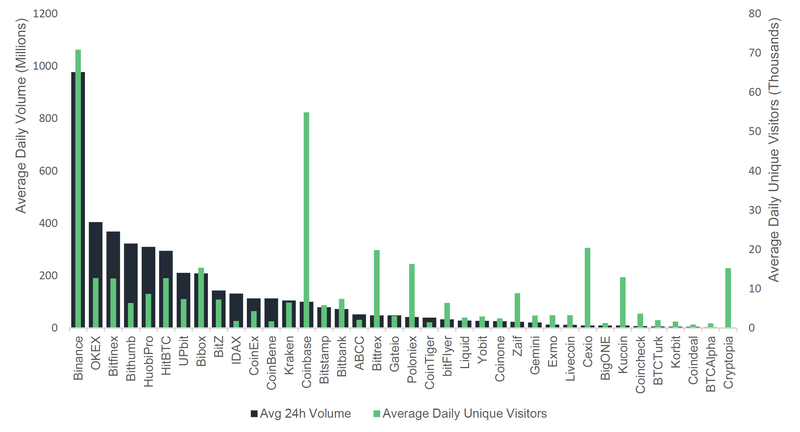 Binance has the highest average daily visitor count, in line with its high trading volumes. 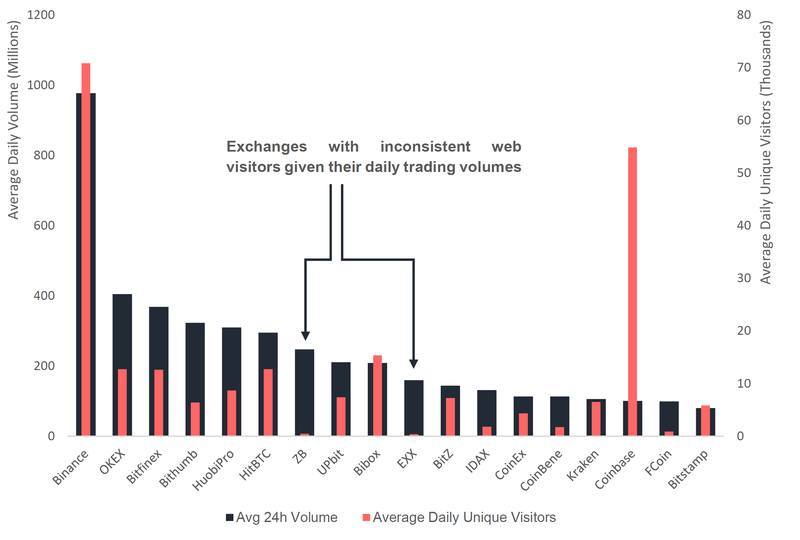 Meanwhile, exchanges such as Coinbase, Cex.io and Bittrex have significantly greater numbers of daily visitors than other exchanges with similar daily volumes. In Coinbase’s case, this can be attributed to the exchange’s reputation and age. ZB and EXX attract significantly lower daily visitors than similarly-sized exchanges. The above figure represents the top 20 exchanges by 24h volume regardless of whether their Alexa rankings are below 100,000. Noticeably, unique visitor counts for exchanges ZB and EXX are significantly lower than other exchanges within a similar 24h volume band. respectively. Despite this, their daily unique visitor counts amount to no more than 700 visitors per day. Although there is a chance that these web statistics may present errors given Alexa rankings below 100,000, in the interests of mitigating any potential risks, these exchanges will be flagged until clarification is provided. The following order book analysis investigates the relative stability of various cryptocurrency exchanges based on snapshots of the average order book depth for the top markets on each exchange in 10-minute intervals over a period of 10 days. In the context of this analysis, average depth down is defined as the cumulative volume required (in USD) to reduce the price of a given market by 10%. This is compared to the average daily volume for the top 5 pairs. 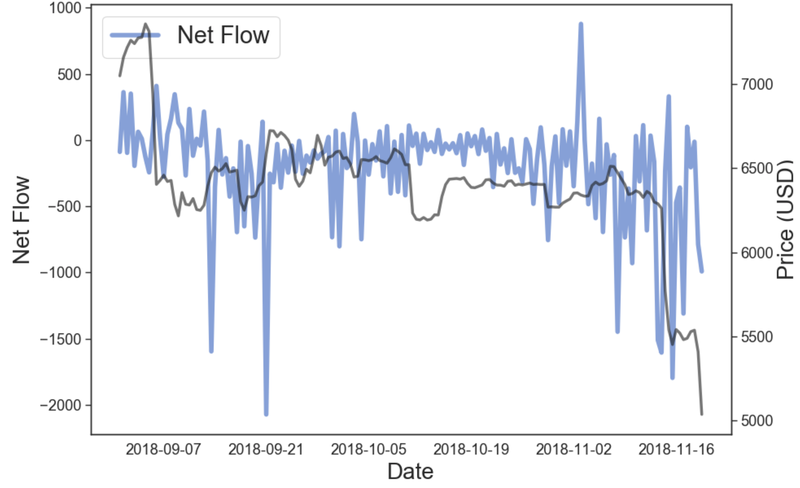 The result of this analysis is that we are able estimate the relative stability of a given exchange based on the ratio of depth down to average daily pair volume. 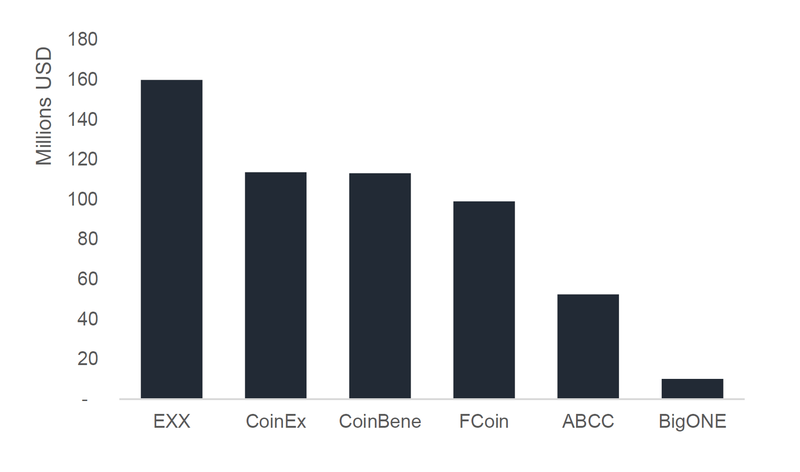 In relative terms, CoinBene, ZB and CoinEx have the thinnest markets. Despite relatively large average volumes per top pair (~12 million USD), CoinBene’s average order book cumulative depth down (order book buy side) totals only 33 thousand USD. In other words, to move the price 10% downwards, a trader would need to sell 33 thousand USD worth of currency. In contrast, Kraken which has similar average daily pair volumes (~13.5 million USD), has an average order book cumulative depth of 4.2 million USD. This is almost 130 times larger than that of CoinBene’s and therefore suggests a much more stable exchange. 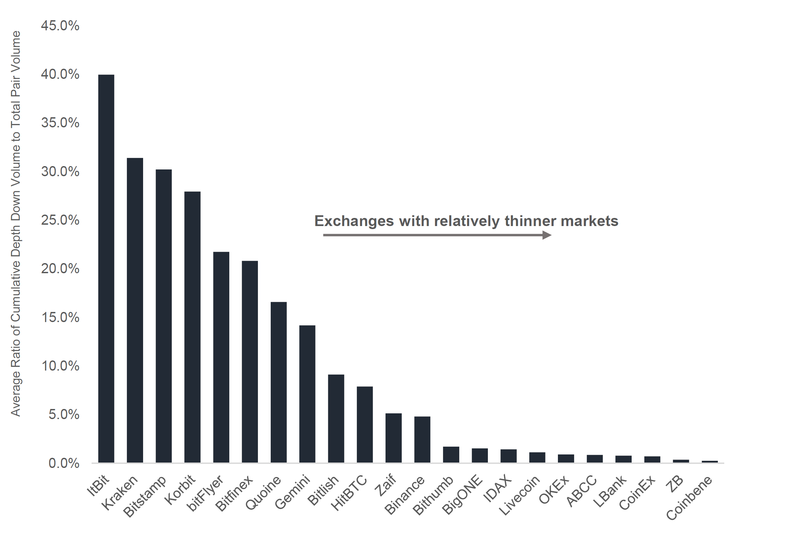 ItBit, Kraken and Bitstamp have relatively more stable markets compared to exchanges such as CoinEx, ZB and Coinbene. In the case of ZB for instance, its depth to volume ratio was just 0.4%. I.e. in order to move the price down 10%, a trader would only need to sell 0.4% of average daily pair volume. These ratios are similarly low in the case of CoinEx (0.7%) and CoinBene (0.3%). Meanwhile other exchanges such as Bitstamp and ItBit, had ratios of 30% and 40% respectively. This is a factor of 100 times greater than those of CoinBene’s for instance. The total average 24h-volume produced by trans-fee mining associated exchanges on CryptoCompare totals more than 550 million USD. This constitutes approximately 10% of total exchange volume over the last 30 days. The total average 24h-volume produced by the top 5 decentralized exchanges on CryptoCompare totals just less than 2.4 million USD. This constitutes just 0.4% of total exchange volume. This security analysis aims to evaluate a pool of the top 100 exchanges by 24h volume considering the proportion of exchanges with both a public privacy and a terms & conditions page. In addition, we analyse the proportion of exchanges that have been hacked in the past as well as the publicly stated proportion of cold wallet vs hot wallet storage for users’ funds. In theory, the higher the amount of funds stored in “cold storage” (i.e. offline), the less exposed the funds held by a centralized exchange will be to hackers. A third of top exchanges store the vast majority of users’ funds in cold wallets. 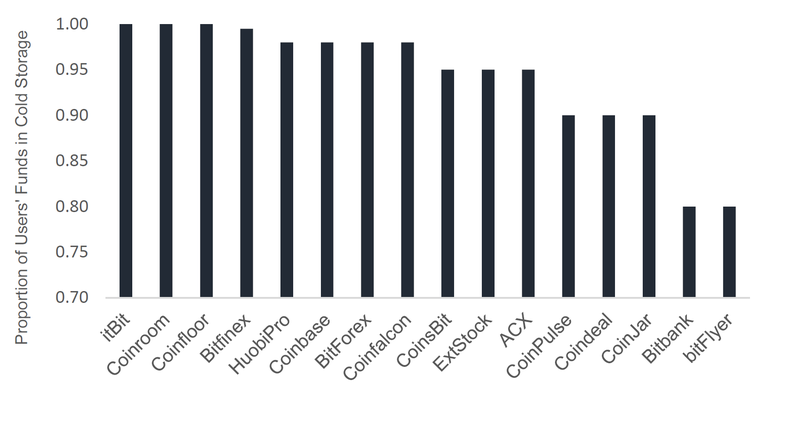 Exchanges itBit, Coinfloor, Bitfinex and Coinbase are among those that store the highest proportion of users’ funds offline. 11% of top exchanges have been hacked in the past. 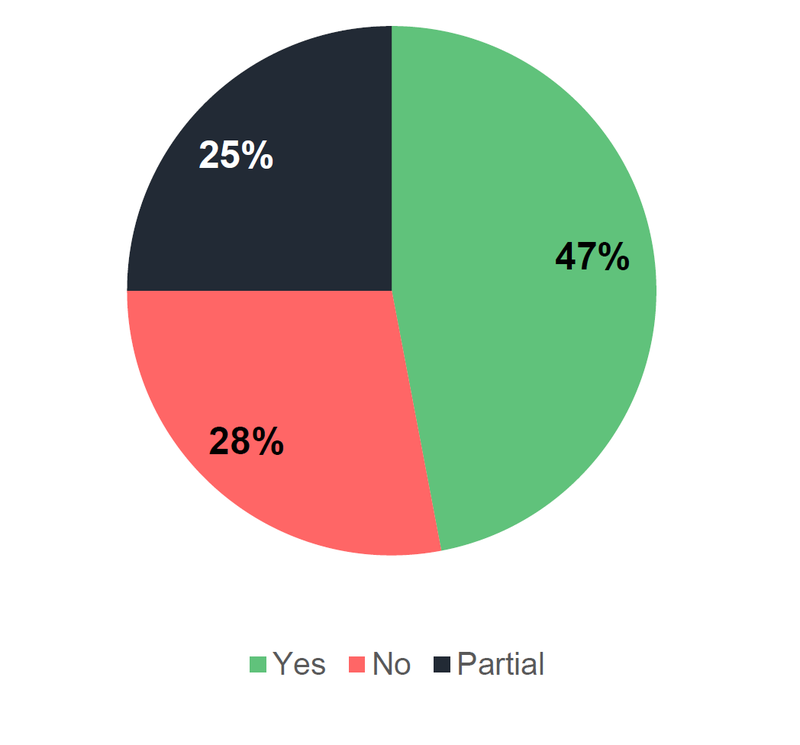 Those that impose partial requirements (25%) require KYC verification in order to conduct certain activities such as to withdraw fiat, to trade fiat pairs, or to increase maximum trading amounts. A visual inspection of the trades on the new exchanges is now carried out. Snapshot data cannot capture volatility, so these trade graphs allow the characteristic trading to be assessed in light of its effect on the CCCAGG. Graphs were produced of all trades vs the CCCAGG for the top 5 trading pairs for each new exchange over the last month. BCEX displays high volatility on both of the pairs that it trades. Buying of large amounts of the order book is visible, suggesting a very thin market. The price on this exchange will accordingly not reflect the price of the cryptocurrency well, so it will not be included. 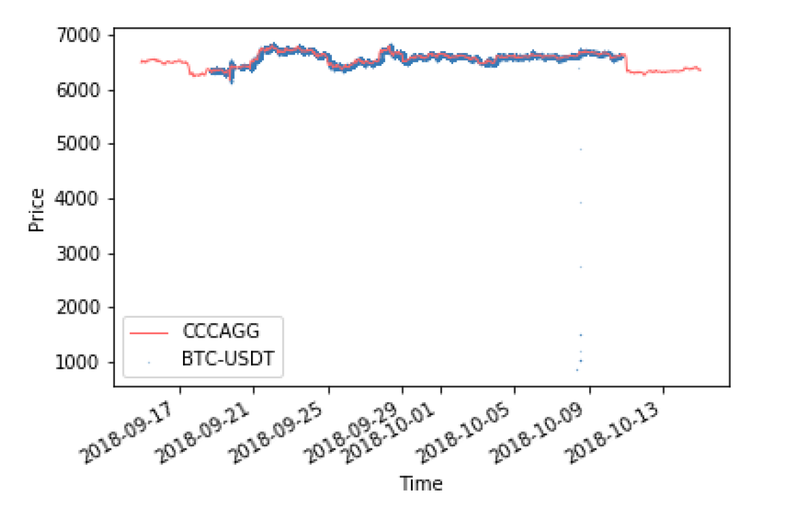 Top trading pairs on CoinTiger display agreement with the CCCAGG, but due to anomalous volumes further monitoring will be carried out before considering inclusion into the CCCAGG. Pairs on ICoinBay show agreement with the CCCAGG. This exchange is a possible inclusion to the CCCAGG. A flash crash on the largest trading pair elicits a longer period of assessment before consideration for inclusion into the CCCAGG. Pairs on Liqnet show agreement with the CCCAGG. However, large amounts of API downtime can be observed. The quality of the exchange API will be monitored and the exchange will be considered for inclusion in the event of an improvement in API provision. Poor agreement with the CCCAGG gives grounds to exclude P2PB2B. 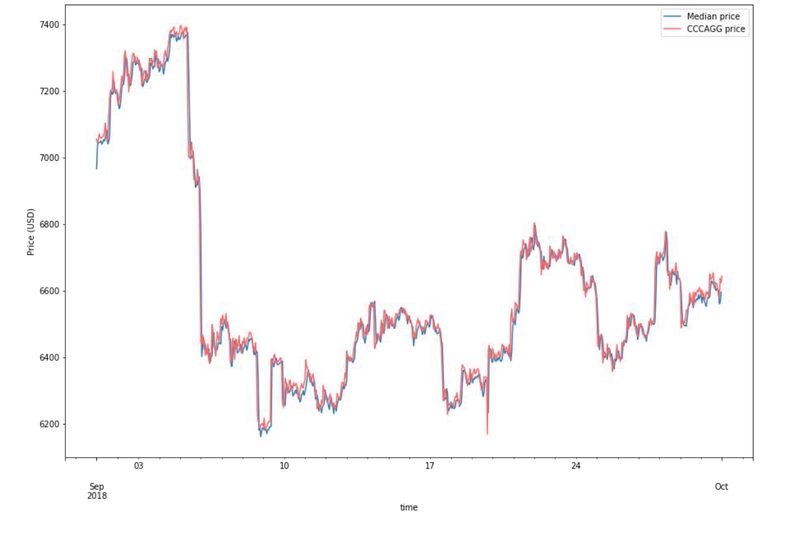 StocksExchange displays some unusual trading activity and a flash crash. The exchange will not be included due to trading behaviour. This section provides a quantitative analysis of trade data received from exchanges. The purpose is to provide an understanding of what the exchange trading ecosystem looks like, and to allow for selection of exchanges that best represent the price of a cryptocurrency. In order to make comparisons across exchanges, an estimate of the trading price of the cryptocurrency needs to be ascertained. For the BTC-USD pair, all trades over a 30-day period were collated and plotted. In this time period, there were around 6.5 million unique trades. The trades are plotted such that colour indicates the density of points in the area. This graph represents the entire ecosystem of the price of BTC-USD trading over a 30-day period. This is now used to generate a representative price for BTC. The median was selected to calculate a trading price for the cryptocurrency. The motivating factor behind this measure being used was the large number of outliers in the trade data set. To keep the computation tractable, trades were grouped into 1-hour long time bins, and the median for each of these bins was computed. 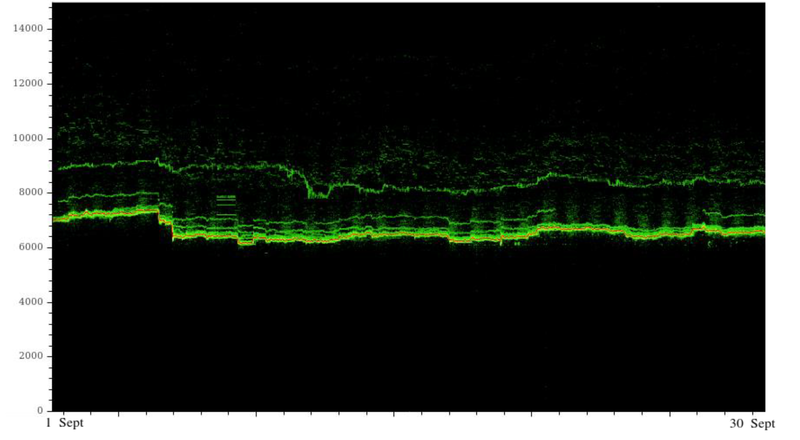 For the purposes of this investigation, volume weighting was not used. This was due to high volume buying up of order books being observed when looking at individual exchange trade data. It was hypothesised that the arithmetic median would better reflect the mid-price of the order books of the exchanges, as the majority of trades take place at the mid-price. The median should therefore reflect the price that the average trade was carried out at. 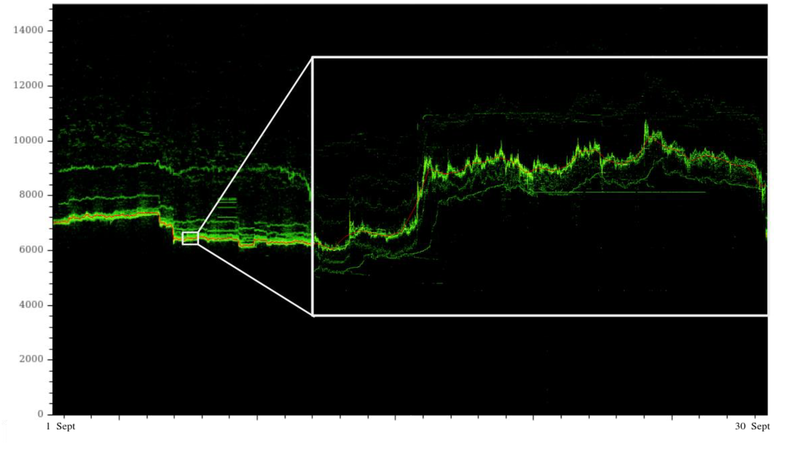 The 1-hour median line was then plotted on the trade data, and a visual inspection of a section of the above graph shows that the line follows the highest trade density, which is indicative that it is a good estimate of the trading price of the cryptocurrency. CryptoCompare’s CCCAGG is an aggregation of trade prices, and aims to reflect the current trading price of an asset. It is possible to validate the CCCAGG price by comparing it to the median trade price. 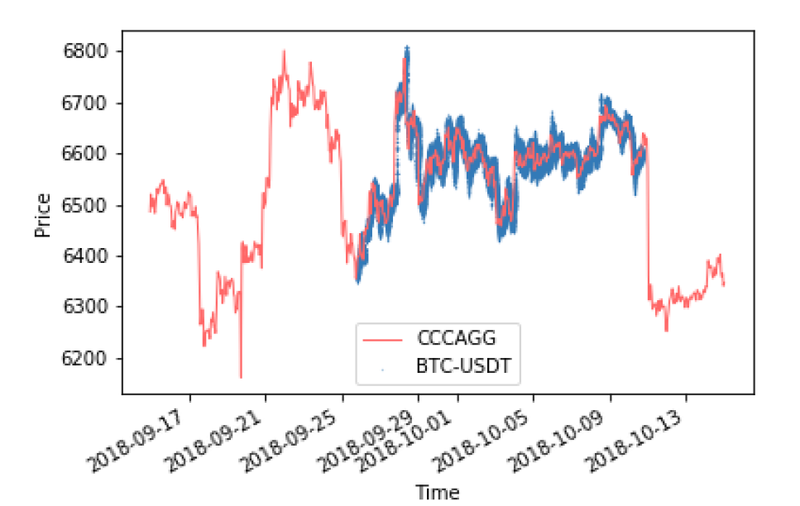 It can be seen that there is agreement between the two measures, suggesting that the CCCAGG is accurately capturing the trading price. Abstract: We are proud to announce the launch of ForkMonitor.info, a new website sponsored by BitMEX Research. The website is connected to several different nodes, both Bitcoin and Bitcoin Cash implementations. It displays various pieces of information regarding the chains followed. This website can be useful for monitoring the situation during network upgrades (softforks or hardforks), as well as being potentially useful in helping to detect unintentional consensus bugs. Thanks to Sjors Provoost for helping develop the site. The website is primarily geared towards Bitcoin Cash, running 8 Bitcoin Cash nodes compared to 5 Bitcoin nodes. The reason for this is the upcoming Bitcoin Cash hardfork, where several different nodes appear designed to follow different chains. The forkmonitor.info website may also be useful in monitoring the situation during this upgrade. 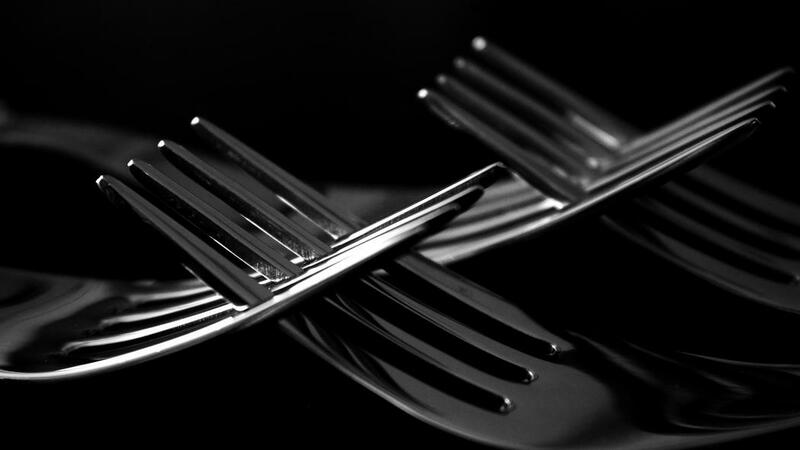 After the Bitcoin Cash hardfork is complete, the website’s intention is to move some of the focus over to Bitcoin. The plan is to run more versions of Bitcoin Core (especially older versions), as well as independent implementations such as Bcoin, BTCD and Libbitcoin. This may be helpful in spotting any consensus bugs, such as the inflation bug CVE-2018-17144, which was discovered in September 2018. The website’s code will be made open source, which may hopefully encourage other organisations to spin up multiple nodes and monitor the chains in a similar way. Bitcoin ABC Versions of Bitcoin ABC after and including 0.18.0 are expected to activate a hardfork at around 16:40 UTC on 15 November 2018, according to the median past time. Versions of Bitcoin ABC prior to this, are not expected to follow this new chain. 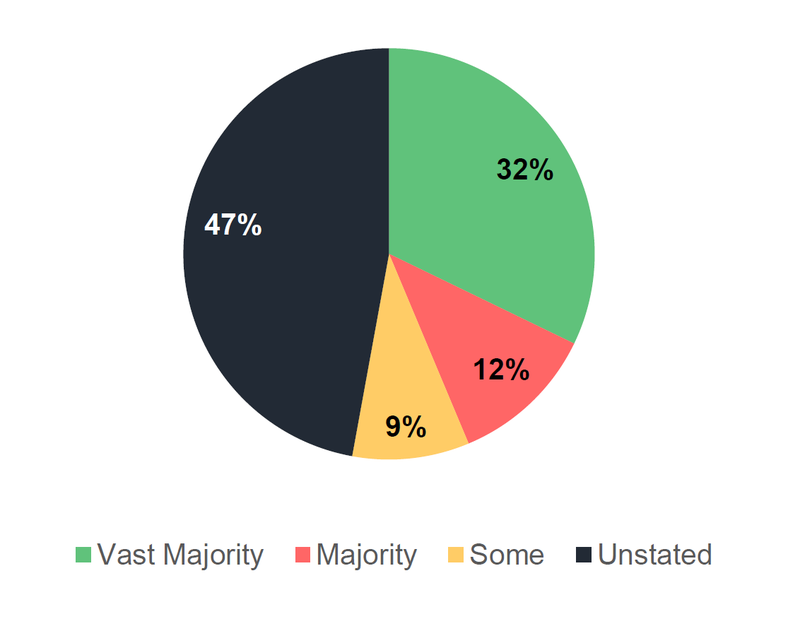 In our view, Bitcoin ABC is the most popular implementation and the economic majority of Bitcoin Cash users are likely to support the hardfork and follow the new chain. It is unclear to us what will happen to older versions of Bitcoin ABC; however, the likely outcome is that no additional blocks are produced on the original chain. Bitcoin SV Bitcoin SV (or Bitcoin Satoshi’s Vision) is a client promoted by Craig Steven Wright, who is popularly known as the “Fake Satoshi”. In 2016, Mr Wright produced what he claimed was proof that he was Satoshi, however it quickly emerged that this was a digital signature copied from Bitcoin’s Blockchain, presented in a manner designed to be confusing. Bitcoin SV is also expected to activate a hardfork at the same time as Bitcoin ABC, however, this hardfork is supposedly incompatible with Bitcoin ABC. In addition to the above, the listed Canadian mining company Squire Mining (SQR CN), with a CAD$65 million market capitalisation, is likely to be supporting Bitcoin SV. Therefore we believe it is likely that despite the lack of community support for Bitcoin SV’s hardfork, the chain could have considerable hashrate, even if it’s only for a limited period. Although, despite all the noise and promotion generated by nChain, Coingeek and Wright, we do not know for sure if the mining pools related to these entities are actually running Bitcoin SV. Even if Bitcoin SV does have significant or even majority hashrate, if the Bitcoin Cash economy ignores it, the chain should have little financial impact. We view this as the most likely outcome. Bitcoin Unlimited There is a third client group called Bitcoin Unlimited. This group’s BUCash 1.5.0 client is designed to follow the hardfork of Bitcoin ABC. Earlier versions may behave differently. While it appears that the economic majority will support Bitcoin ABC’s hardfork, there is significant uncertainty over how each client will behave and which chains they will follow. Therefore, BitMEX Research has sponsored this new website which has launched before the hardfork is due to occur. This will hopefully provide useful information to some stakeholders, as the events get underway next week.